The Boidies is on the sampler! Spring Typography by Just Nan is now a finished piece. 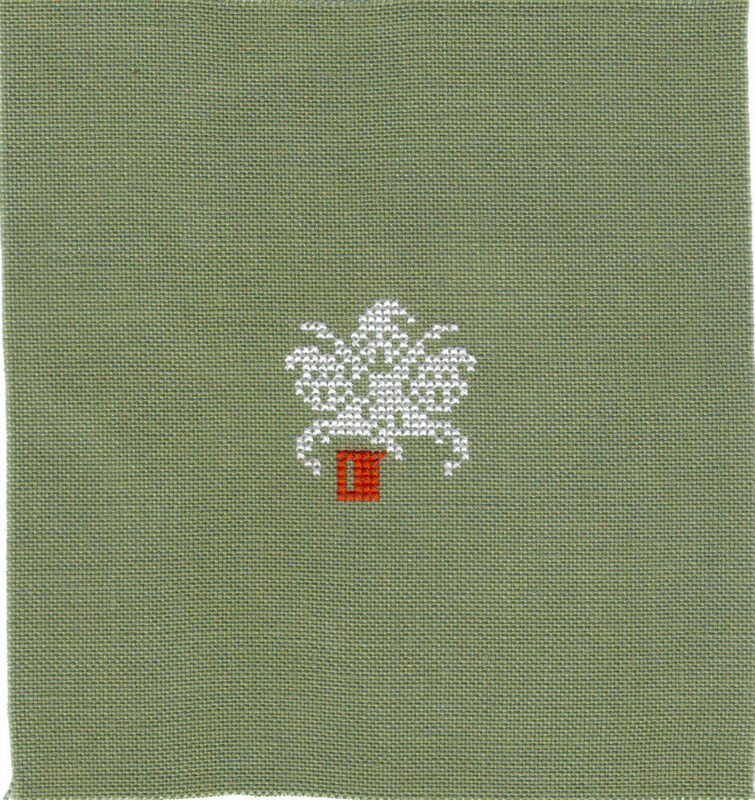 I stitched this on 32 count Dark Reed Green linen from Willow Fabrics using the recommended DMC and DMC conversions. I recharted the animals to be over one as per the previous two Typography samplers. I am particularly pleased with how the little fat birds came out compared to the over two versions. I also followed the pattern of the previous two Typographys to change one of the words. We had Awesome Autumn and Winter Wonder. Can you spot the Spring change? I'm currently painting a frame for this so I can get it on display while Spring is still here. Everyone seemed to like my latest start, another Just Nan design but a spooky one this time. Scream Girls is now a quick finish! I'm going to pop this one in the printer and try scanning it to get a better picture. The green from the previous photo was much more realistic. I was smiling when I stitched this one because of the title - Scream Girls. How do we know the ghosties are girls? They look just like all of Nan's other ghosties apart from one thing - eyelashes! Yes, in the world of cartoons, eyelashes signify female. Male characters do not have eyelashes. Don't believe me? Check out the exhaustive investigation done by The Malcontented Mother. 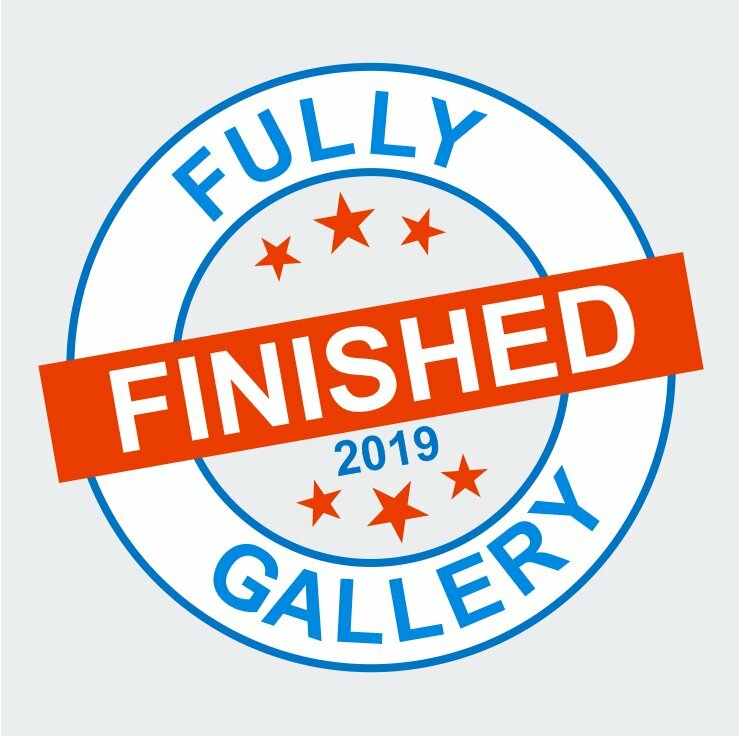 And what do two finishes mean? Time for another start!! I did debate over this one, whether to have another start or continue on with Little Snowy Silver/Gray Cottage and then I thought "It's the Fifth Friday in my Four Weekly rotation so it's a bonus week, let's go for the new start." The photo is rather blurry because that was the only way to get the colour accurate! Trust me to pick another hard-to-photograph fabric. This is going to be Ornament Number One from Teresa Wentzler's Byzantine Ornaments Collection. 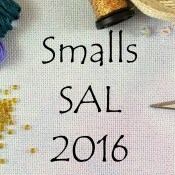 Heather Silver Lotus is stitching these for her smalls this year which was my inspiration to start them too. 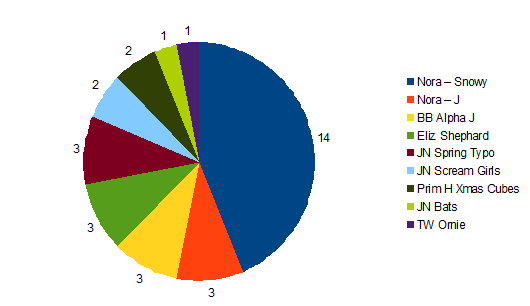 Typical TW, there are two lots of blended colours in here already and a lot of fractionals too. This is all the cross stitching, the rest will be speciality stitches. I am also thinking of adding metallic backstitch to bling it up a little. Little bit more hedge on the right and the same amount of hedge and wall on the left side. Some Blue Rays as snowflakes and fallen snow and then the beading! I have put together my usual Pie Chart for the month's stitching but realised that I hadn't included my Stitching Spend last month. So here is March and April. Total for April - £ 86.97 Good job I am not doing Stitch from Stash this year! The 365 motifs book, the eBay fabric and the first two charts were impulse buys because they were bargains! The Imaginating Hallowe'en chart will do for the Hallowe'en Blog next year and the Dragon Alphabet for the Alphabet Club when I finish the Stitcher's Alphabet. Nothing like planning ahead! The Discworld Map was unmissable at 20% off introductory offer and is an investment! The beads I need for the Brooke's Book's Stitcher's Alphabet and the pink fabric is for Summer Typography which a little kookaburra tells me is my Birthday present this year. All I needed from SewandSo was the beads but you can't waste postage on that so I thought I'd spend some of my overtime money on fabric and another JN chart for the collection! Next month the theme is Reindeer and there isn't a cube with a reindeer so I shall be picking a different ornie for May, how exciting! Finally, another mention of the Days of Jo's Life - Big Birthday Blog Hop. To take part all you have to do is leave a comment or email me. Nearer the date I will allocate you a Year of My Life and on the 17th September you do a blog post about that year or that life event in your life or what you were doing at that age (assuming you are that old!). Also, post something you have stitched which you think I will like. According to the number of people signed up I am now in my mid-thirties so if you want to take part and make me closer to my actual age, please leave a comment! 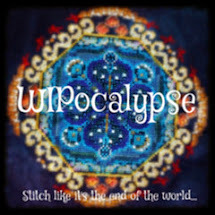 I have worked on 4 out of 16 projects since my last WIPocalypse, plus 4 from my series list. I got bored with the silver so moved onto the bronze in the windowframes. very bad photo of the colours! April - What do you listen to while you stitch? This is an interesting one because last time I answered it, the TV was on a lot of the time. This year, the Small Boy has decided the TV is not allowed to be on during the day! So when he is at home the Large Boy and I have taken to sitting at the kitchen table and watching YouTube together. Sunday afternoons we watch a film via the disc-drive or YouTube. The rest of the time, it's either comedy clips or I have started following some FlossTubers. He likes their accents and the way they get excited about projects ("it's so purrty! ", also "flaaass taass", he loves that one). 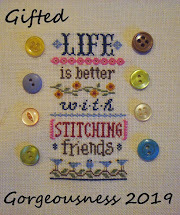 I rather like having someone in the room with me chatting about their stitching and stash. 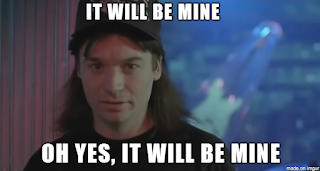 The rest of the time I still listen to Planet Rock on the radio, which is what is on at the moment as I type this out. Talking about other media brings me to Bloglovin' which is one of the popular ways of following blogs. I have been getting emails from Bloglovin' telling me about new followers but only recently found out where the whole list of them is! I have 245 extra followers! Well, not actually because some do already follow me "properly". So my request is - if you follow via Bloglovin' could you possibly click on the Followers button to the right of my blog. And leave a comment too, it's nice to chat with my followers. If you have a blog yourself, I promise to return the following too. Finally, my map chart arrived!! It's really well presented and laid out. I will do a full review once I've had a proper peruse. 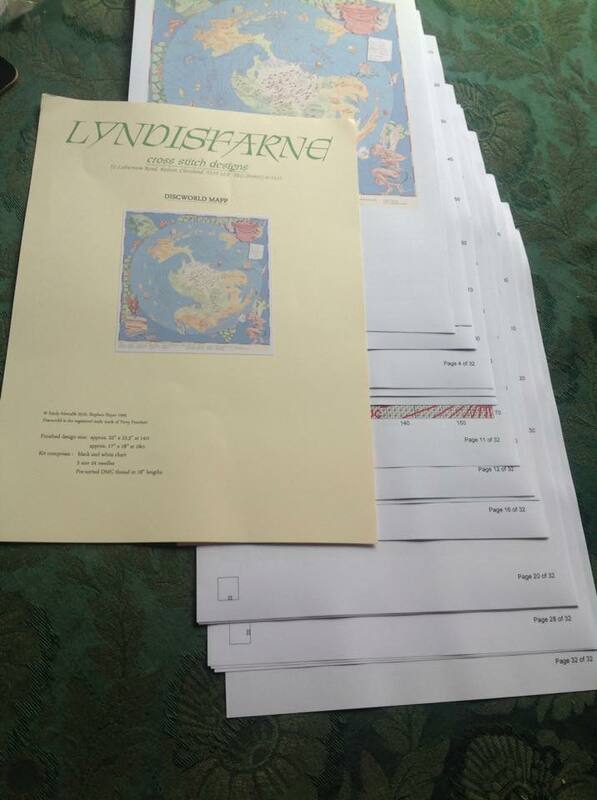 30 pages of chart and 2 pages of key! 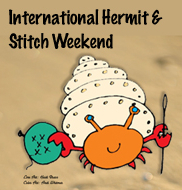 Back in 2011 Joysze of Random Ramblings coined the phrase International Hermit and Stitch Weekend where you spend as much of the weekend as possible stitching. It always commences the Third Friday of every month and there is a sign-up post on Joysze's blog. Here are the guidelines for IHSW and here is April's sign-up page. You can also copy Hermie the crab onto your blog to show everyone you have joined in. The focus of all my IHSWs this year has been Elizabeth Shephard by The Scarlet Letter. This is a long term project started back on Day 14 of the DUCJC 2015 and worked on each month since then. She is a Quaker so you get a mini Happy Dance with each complete motif. These brown motifs are in the bottom right of the design. So I have completed 3/4 of the whole piece now, Just one more whole motif and a few half motifs round the edge. 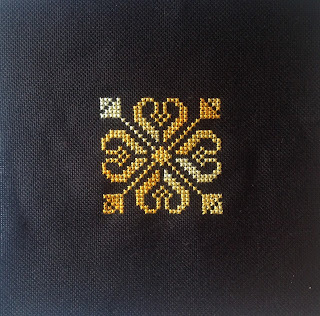 The centre six motifs are stitched in green with the edge ones in brown. I wonder if this was a deliberate design choice or if Elizabeth ran short of the green thread? She couldn't take advantage of next day delivery from SewandSo like we can! Here is the full piece so far. Next month I'll finish the current motif and start the final whole one which features a traditional swan. That is a white bunny appearing behind the pink I and N, not a ghost; this is Spring not Hallowe'en! Isn't it awesome? Bonus points to anyone who identified it without reading on. 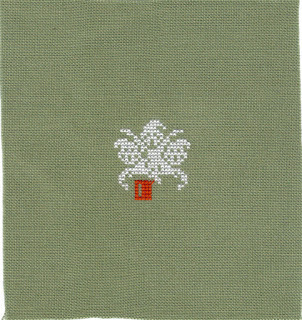 It is designed by Lyndisfarne Cross Stitch Designs and is on special offer until 25th April. You can buy the chart, the full kit or a partial kit which doesn't include all the blue of the sea so you can stitch it on a hand-dyed fabric. There are More photos on Facebook. Of course, I sent the photo straight off to Dawn from Crafty Kitten. "I need a blue gradient fabric, light blue in the centre getting darker as it spreads to the edge." It won't have the distinct line between the two blues but that would be almost impossible to get in the right place. I have also emailed the designer (who is lovely) and checked that it is charted by eye and not CGI. You know how much I hate the confetti style computer generated stitching. 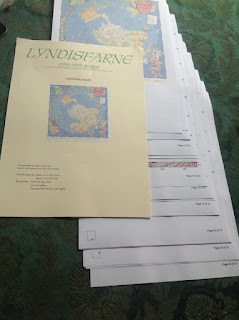 There are 32 pages of chart and on 28 count it will measure 60cm square (24 inches). Slightly smaller on the 32 count I plan to use. A page a month will mean a three year project! Have you guessed yet? 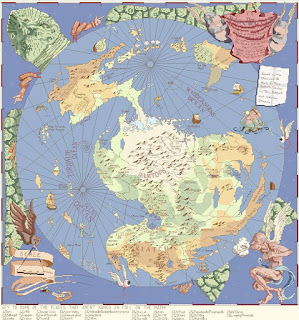 It is the Discworld as created by Sir Terry Pratchett, map assistance from Stephen Briggs and drawn by Stephen Player. And once payday arrives on Wednesday it will be mine! A: a tin full of Bling ORTS! I've been working away on Nora Corbett's Little Snowy Gray Cottage although to be honest, it should be Little Snowy Silver Cottage there's so much metallic sparkle in there. Even the fabric is sparkly, Blue Hydrangea from Crafty Kitten. I've been trying to alternate the Kreinik with the plain thread but the Kreinik is actually playing quite nicely and I'm enjoying the stitching. In the evenings I am working on Just Nan's Spring Typography, approximately 30 minutes per evening while the Small Boy is splashing in the bath. NB do not sit too close to the tub! stitched on 32 count Dark Reed linen from Willow Fabrics. I'm stitching them on a lovely 35 count linen called Country Mocha by Willow Fabrics using the recommended DMC. I have changed the white to B5200 rather than Blanc because it will pop more against the neutral fabric. I made a few changes to this one. One was a forced change because I made a booboo with the placement of the central ornie which meant the snowman was also too low down. Luckily there was enough room for the T to fit in. 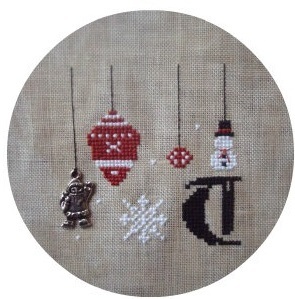 The other change was adding a Santa charm instead of the rusty bells shown on the cover photo of the chart. The snowman is not stitched with any features but I asked the Christmas Ornie SALers and the consensus of opinion is "add eyes" so, the ayes have it and I will be adding eyes next time I stitch on this design. Anyway, to take part all you have to do is leave a comment or email me. Nearer the date I will allocate you a Year of My Life and on the 17th September you do a blog post about that year or that life event in your life or what you were doing at that age (assuming you are that old!). Also, post something you have stitched which you think I will like. It's my Fifth Blogaversary today. The photos were taken on my Fifth Birthday at my Nana's house. We had recently returned to England after an army posting to Singapore for several years. Do you see those strange white things on my feet? Socks! We had to wear socks and shoes all the time in England. And long sleeves. And cardigans. My first memory of England was standing on the railway platform wondering why it was so cold when I was wearing all these extra clothes! It was August too. We brought back an enormous amount of stuff, several packing crates worth but my dolls' pram had to be left behind. 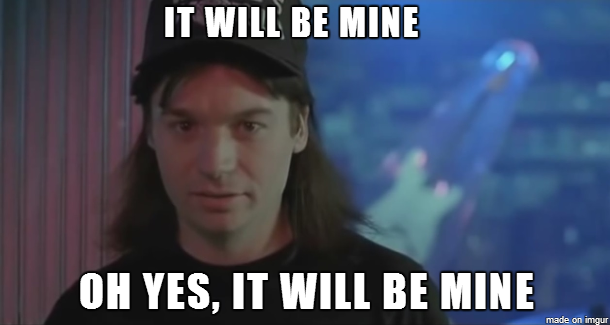 So I'd been promised a new one as soon as we got back. It was a beauty, a twin pram with a hood at each end, you can just see my two dolls sat at either end. I still have the pram, it lives in a cupboard now waiting for my grand-daughters to arrive! It has been played with by various visiting children but not often. She was a gift from Justine and started on Day 30 of the DUCJC2015. I restarted her on 17th March, 2016 and finished her on 5th April, 2016 having put in a total of 9 stitching days. The beading took up two of those days! She is stitched on 32 count Love-in-the-Mist Murano from Crafty Kitten. The same fabric as her sister E. I used most of the Crescent Colour threads but substituted Blanc for the wings (one skein of Cloud was not enough to do four sets of wings on four fairies) and some of the greens. I blended 3362 and 3363 instead of Desert Mesquite. 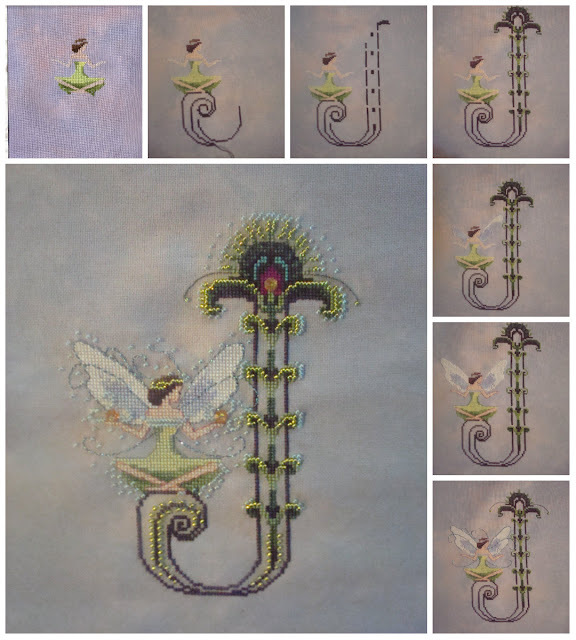 I also changed the backstitch colours to 356 for the skin and green for the dress. 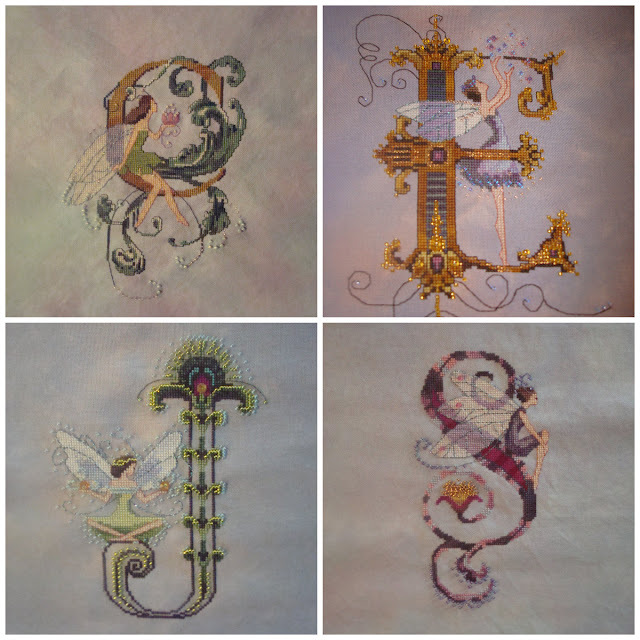 I did all the scrolls in Kreinik too. Action shot to show the beads! There are a lot of beads in her. The large flower beads in her hands look great too. I don't plan on stitching any more of these at the moment. Unless someone has another daughter unexpectedly! 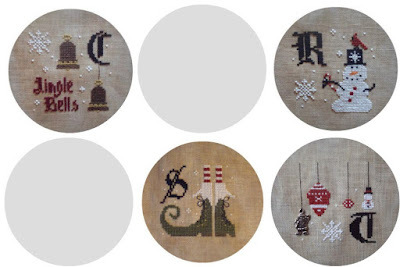 The temptation to stitch all 26 is quite overwhelming at times but I will resist. Finally I am celebrating a Big Zero Birthday in September and have planned a BIG BLOG HOP for the event. My plan is to attempt to get one Person per year of my life and allocate each person a year. I will give you a Fact About Me from that year and ask you to base your post on that fact. So you might get 1971 - "I am five years old and I start school". Your post could be about you being five, you starting school, you in 1971 (if you were born by then) or some world event which is relevant to you from 1971. I will ask you to post a photo of something you have stitched which will appeal to me! 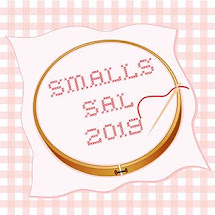 I think you all know my tastes in stitching by now and I'm looking forward to some eye candy and probably some stash acquisitions too! Got to have something to spend that Birthday money on. So if you want to be in the Hop, please leave a comment or email me. Because we need so MANY participants for this one, please feel free to share it on your blogs and invite your friends to join in. The more the merrier! We can always share eventful years or skip the dull ones depending on how many people we get. Over the weekend I am going to try get an image we can all use to advertise the Hop and maybe set up a separate page with a linky.